Sadly, perhaps the most important date in American history goes unobserved by most of us. That date is today, September 17th. On that day in 1787, delegates of the Philadelphia Convention signed the United States Constitution into being. Although it wouldn't actually take effect until 1789, the Constitution was born on Sept. 17, 1787. The signing culminated months of debate, discussion, and dissent from the delegates. Out of that cacophony of voices and opinions came the greatest document ever produced in human history. The long, grueling process undertaken by the Philadelphia Convention is beautifully chronicled in David Stewart's book The Summer of 1787. Every American should read it. 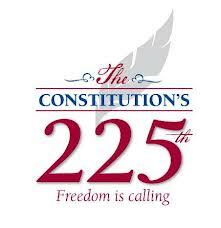 It is time ordinary Americans stand up and take action to "preserve, protect, and defend" the Constitution of the United States. Apparently those words are meaningless to Barack Obama. The first step to take is obtain your own copy of the Constitution. I recommend Essential Liberty, a tiny pocket sized guide to the Constitution and the other founding documents of the United States. It is available at http://www.patriotpostshop.com/. Buy several, distribute them to your friends, and READ IT. Keep it in your purse, briefcase, glovebox, wherever. Refer to it when you hear discussion of constitutional issues. Don't let the secular progressives tell you what the Founders "really" meant. Read their words for yourself.